Clinton Bennett is New World Encyclopedia's History and Biography editor. Dr. Bennett has taught courses on B.Ed, BA, B.Th. and M.Th. degrees in Hinduism, Sikhism, Christianity, Islam, Buddhism, Methodology, Ethics, Area Studies (Asia and the Americas) and World Cultures at Colleges and Universities on both sides of the Atlantic. He has also taught as a member of interdisciplinary teams. He has supervised Masters dissertations on a wide range of topics. Dr. Bennett was cross-listed as a member of the Asian Studies Faculty while at Baylor University (1998-2001) where he was an associate professor. He was Subject Leader for Religious Studies at Westminster College, Oxford from 1992 until 1998. His MA and PhD research analyzed Western approaches to Islam against the background of colonialism and Christian mission, especially in India. His special interest focused on how ideological presuppositions influenced scholars’ assessments of Islam. Dr Bennett was ordained as a Baptist minister in July 1978. He was a missionary in Bangladesh (79-81), director of inter-faith relations for the British Council of Churches (86-92) and associate pastor of a multi-racial congregation in England (85-92). He has served on consultations and working parties of the World Council of Churches and on the executive committees of numerous community and inter-religious organizations. He chaired a school governing body and advised local and national government on religious education. He has assisted several mosques with funding, charitable status and planning applications. Dr Bennett achieved his PhD in 1990 at University of Birmingham in Islamic Studies. He also holds a Certificate of Professional Studies in Education awarded in 1994 by Oxford University Delegacy of Local Examinations and an M.Ed in 1996 from the University of Oxford in Adult and Distance Teaching and Learning. He is a Fellow of the Royal Asiatic Society, the Royal Anthropological Institute and the American Biographical Institute and a Member of the American Academy of Religion. 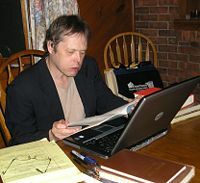 Dr Bennett has authored six books, co-written one and has edited and guest edited journals. He has advised Oxford University Press, Routledge International, Ashgate Press and Continuum International. He currently teaches Religious Studies at the State University of New York at New Paltz. This page was last modified on 12 December 2008, at 06:03.